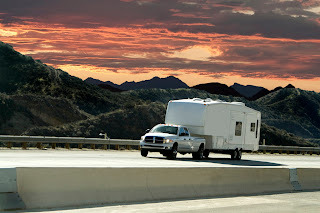 Fifth Wheel Travel Trailers are the trailers you see that extend over the bed of the pickup or custom tow vehicle. This bi-level design results in fifth-wheels offering the most living space of any towable RV. They range in size from 21 to 40 feet. Fifth wheel trailers require a special type of hitch to be installed in the bed of the truck. The truck must be properly equipped and capable of handling the weight; this includes the trailer pin weight placed directly over the rear axle of the vehicle. 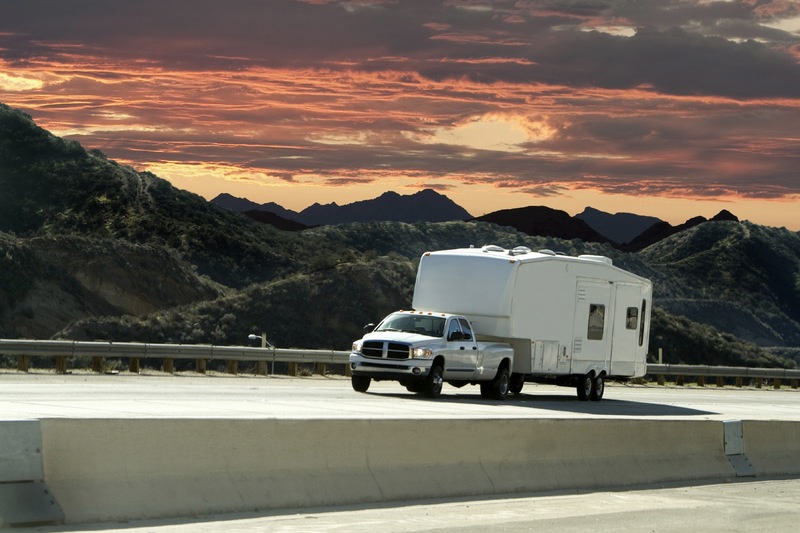 Fifth wheels tow and handle better than conventional travel trailers, and combined with spacious living quarters are often times the choice for fulltime RVers. Fifth wheel trailers, like other towables, are available in entry level, mid-line and high-end models. Fifth wheel trailer manufacturers offer many different floor plans. Two-thirds of all fifth wheels built today offer at least one slide-out and most have multiple slide-outs, increasing the already spacious interiors. Lightweight versions that can be towed by smaller trucks are also very popular. Construction techniques vary from wood frame with aluminum siding to welded aluminum frame with fiberglass siding. Like most other RVs, fifth-wheels offer kitchen facilities, dining areas, living rooms, bathrooms and sleeping arrangements. Optional equipment like generators, make fifth-wheels fully self-contained. Fifth wheel travel trailers can sleep up to six people, depending on the model and prices range from $14,000 to $120,000. I am the founder of a company called RV Education 101. We produce videos on how to use and maintain Recreation Vehicles, and I am the author of a book titled “The RV Book”. I started the company because I was concerned about the lack of education and safety awareness for the RV consumer. We welcome you to LINK to this blog or any post within this blog. You may not copy the article in it's entirety and post. You may only use a small introduction of the material with an unaltered clickable link. Full attribution must be given by using UNALTERED CLICKABLE links in addition to giving FULL credit in plain view to Mark Polk and RV Education 101 with a SPECIFIC CLICKABLE link to the ORIGINAL content. You may not claim any of this content as your idea. Other unauthorized duplication and/or use of this material without the express written consent of Mark Polk is strictly prohibited.